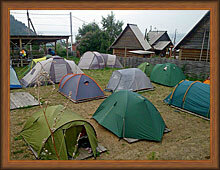 Derevenka offers accommodation in camping tents. 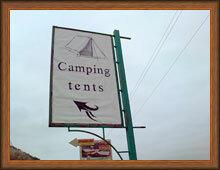 You can arrive to the camping and install your own tent. If the size of your tent does not exceed 205x315 sm you can establish it on already prepared wooden scaffold (at this case there is no necessity to dig round tent). If your tent has the greater size you can establish it directly on a ground. 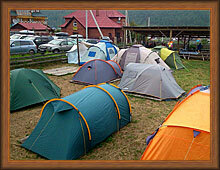 Price of tent installation: 200 rub/day per 1 person . We do not supply any sleeping equipment for overnight inside tent. You should take care of sleeping bag and mat yourself. A food. Wooden tables with benches under a canopy are established at camping. You can use marching gas stove to prepare food for yourself (if you have own utensils and if you want to cook). Gas balloons for the stove can be bought from us. You also can eat in one of cafe in Listvjanka (see Listvjanka map). Kindling of fires is PROHIBITED at Derevenka. Hygiene. 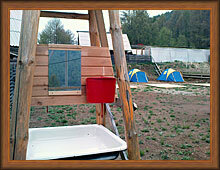 The toilet and washstand with cold water for camping guests are located outdoor. Its using are free of charge. You can take shower in our summer shower cabin (hot water, adjustable electric heater, 100 rub/person) or experience Russian Bania (kind of sauna). Security. The territory of hotel and camping site are under round-the-clock video observation and protection of private security agency. ATTENTION! 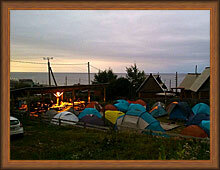 We pay your attention, that the number of places in camping is limited. If you decide to stay at us, we strongly recommend beforehand to be convinced available free places for date interesting you and to issue the advanced order. Please see our Booking page.